The well being of a nation depends upon sustainable development, and for this, water supply and sanitation are essential requirements. Proper sanitation facilities are in turn, essential ingredients of a healthy and productive life. For better health of people, the provision public utilities like water supply and sanitation is necessary. Availability of water and good sanitation contributes significantly towards improving human lives and in the development of every country. This has inspired NGOs to assist communities in acquiring such facilities. Most international and local NGOs work closely with communities, especially disadvantaged communities, because that is where they see the most need for their assistance. NGOs have stepped in with various programmes aimed at improving the sanitation facilities for people. 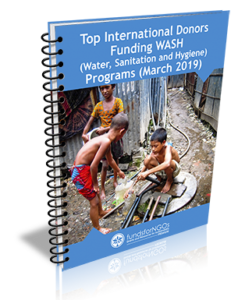 Therefore, acknowledging the significance of this topic, we have made a guide on “Top International Donors Funding WASH (Water, Sanitation and Hygiene) Programs (March 2019)” available exclusively for our premium members. If you are a FundsforNGOs Premium Member, you can download this document by logging in here.